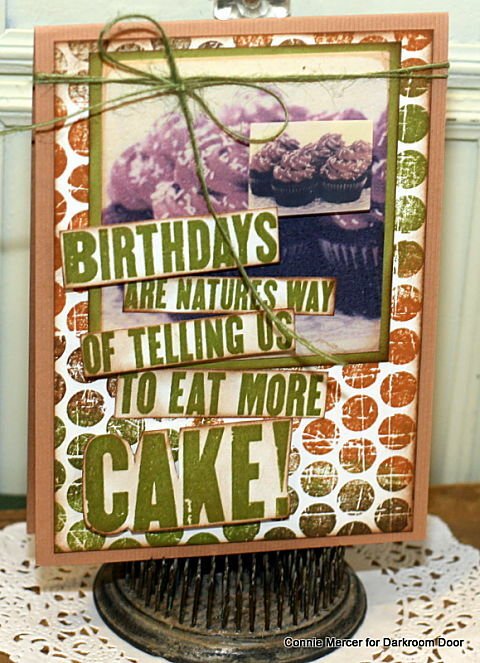 crafty goodies: Eat More Cake with Darkroom Door! Stamp on white cardstock, using the Polka Dots Background stamp. Trim and shade with brown ink. Mount on cardstock. Mat Photo Chips/ Sweet Treats with cardstock an add small Montage/ Sweet Treats to the center of the Photo Chips. Stamp Quote on white cardstock. Trim out into word strips and shade with ink. Add to card front. Add trim. 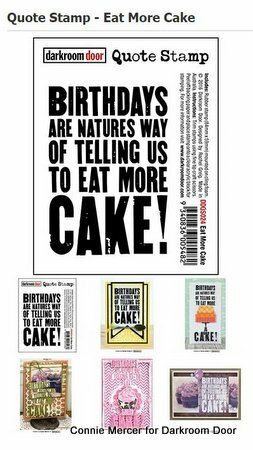 For more inspiration using this stamp go HERE. Love love love this! LOVING that sentiment!!!!!!!!!!!!!!!!!!! LOL. Very fun and soooo true.